Receiving my first Good Luck card | Just a reminder to SMILE! | Chilling with the beagle, Bleu | Selfie before date night in Birmingham | Thinking of ideas for a potential novel | Enjoying The Hummingbirds new album. So this week has been an odd one; I found out last week that I have scored myself a new job (blog post coming up on this next week) and that I start on the 4th April. Seeing as I left my previous role in Liverpool last month, I haven't had to give notice to anyone and right now, it really is a case of just waiting to start! I have done some temporary work over the last few weeks, as well as helping my sister create some content for her website, but I am ITCHING to get started at my new job now! Although it is nice to have a few days off here and there, a few weeks is just a bit too long and I'm beginning to run out of things to do! Just one more week and I will be back to a career girl and very much back to normal. Apart from sorting out paperwork for my new job, this week has been fairly relaxing after a hectic weekend of looking after/being funny Aunty Beth for my niece Felicity and drinks in Birmingham. My grandparents arrived back home from their holiday so I have spent a huge amount of time with them; with them living next door, it's like losing a limb when you don't see their car on the drive for longer than a few hours, let alone a week! I caught up with friends in Liverpool through various phone calls and facetime's, tucked into a brand new book (does anyone else appreciate the satisfaction in cracking the spine in a book?!) and started thinking about my blog and what posts I can do in the future. On Thursday, Me and Gemma got thinking about city breaks we want to do over the next couple of years with our other friends after our time in Amsterdam was such a success. So right now, we're fairly sorted until Winter 2018! Good Friday saw me head to my sister's to have a catch-up and play with my niece (I will never, ever turn down playing with a Disney princess castle.) Afterwards, me and my friends caught up over a curry and a pint at our favourite curry house and then a couple of drinks at the good old Station Inn. Over our catch-up, we planned a potential log cabin stay over New Year and a day at Worcester Races in June, seeing as we're all a bit too broke to head to Ascot anytime soon. In true bank holiday style, I've been watching a few Carry On films with my dad today (I'm sure that is a bank holiday rule by the way) and having a good spring clean of my bedroom. 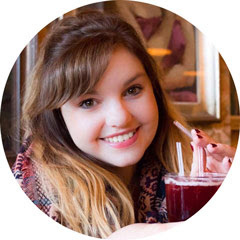 I've also managed to get my head around Bloglovin! Tomorrow, we're having the family round for a big dinner and most likely far too much prosecco. We're going to enjoy turkey and pigs in blankets as we didn't get to meet up over Christmas, so apart from the presents, it's basically Christmas take 2. I will also be enjoying an Easter egg (or two) throughout the day!